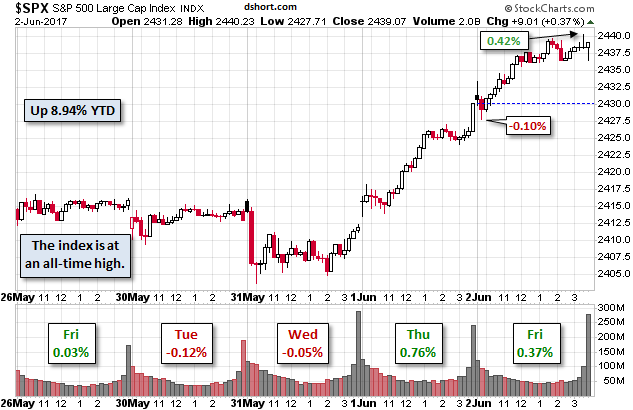 Stocks continued higher last week, with the S&P 500 rising by 0.96 percent to 2,439.07, a new all-time closing high. 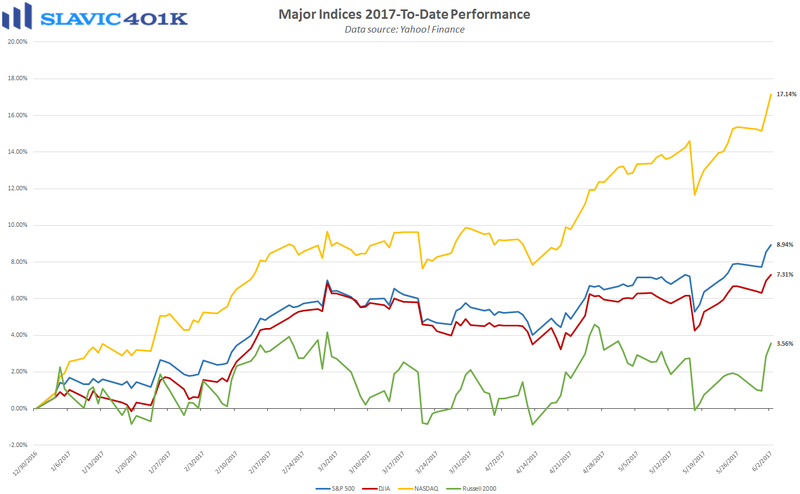 That was also the second weekly gain in a row for the benchmark index, and it left the S&P 500 up a solid 8.94 percent 2017-to-date. 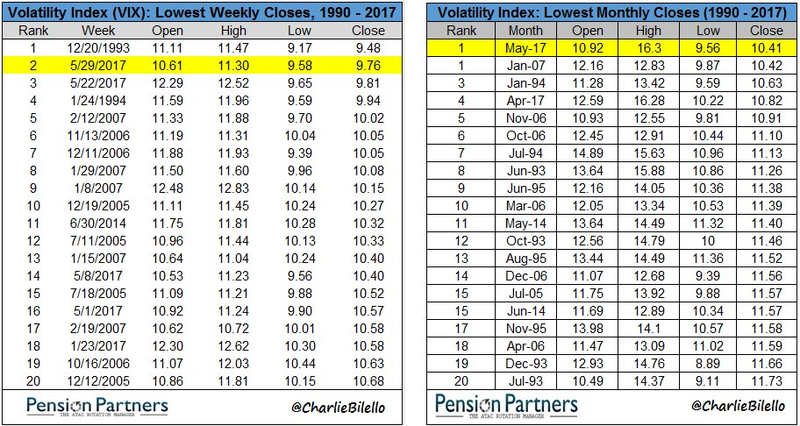 At the same time, the CBOE’s VIX volatility index, often referred to as “investors’ fear gauge” ended last Friday at 9.75, its 2nd-lowest weekly close in history. 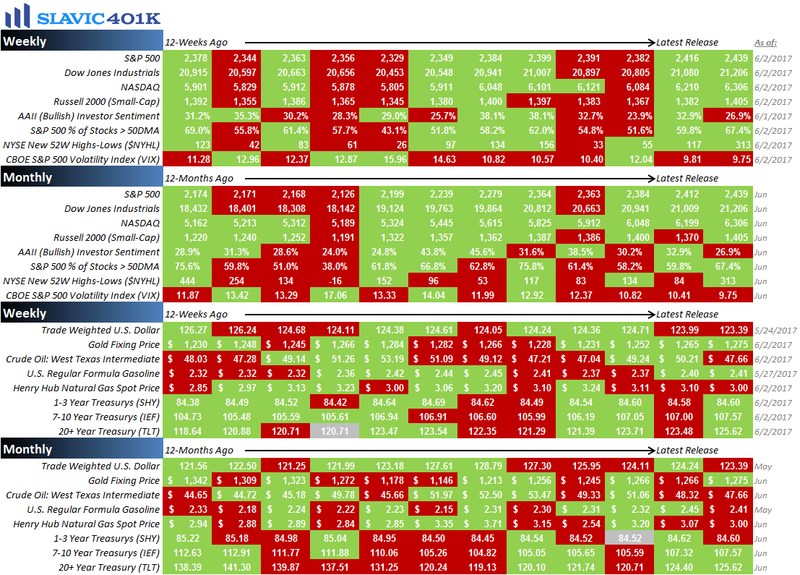 As for performance during the month of May, the S&P 500 rose by 1.16 percent, up from April’s 0.91 percent increase and the best monthly gain since February. Participants in tax-advantaged 401(k) plans fared even better in May, according to new data from the Employee Benefit Research Institute (EBRI). Specifically, the average 401(k) account balance for younger (25-34), less tenured (1-4 years) workers rose by 2.6 percent last month, while older workers (55-64) with more than 20 years of tenure saw their 401(k) balances rise by an average of 1.3 percent. Even more impressive is that since the start of 2015, the average 401(k) account balance for younger, less-tenured workers has surged by 121.6 percent, while the S&P 500 has gained just 17.14 percent (through the end of May 2017). Older, more-tenured workers saw their 401(k) balances rise by an average of “only” 23.6 percent during this same period, not surprising since these individuals tend to have much larger accounts that are less sensitive to both contribution size and market fluctuations. More importantly, these substantial gains should provide further evidence of how effective consistent participation in a tax-advantaged savings vehicle can be when trying to amass a significant retirement nest egg. Additional assistance is available through the use of dollar-cost averaging and regularly consulting with a professional financial advisor. As always, we are here to help with any questions you may have. 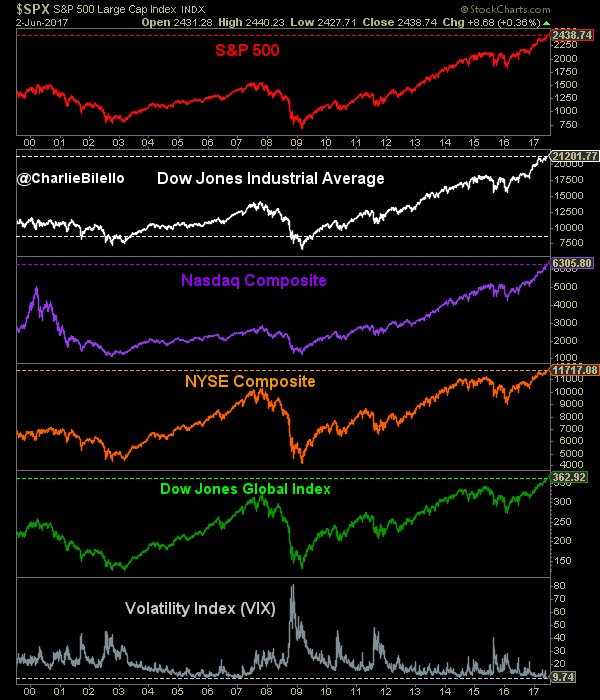 To recap a few of the things we learned about the economy last (holiday-shortened) week, the positives included that factory activity in the southern region of the country accelerated, consumer inflation pressures moderated, private-sector payrolls growth among small businesses firmed, and the government’s measures of both unemployment and underemployment fell to cycle lows. 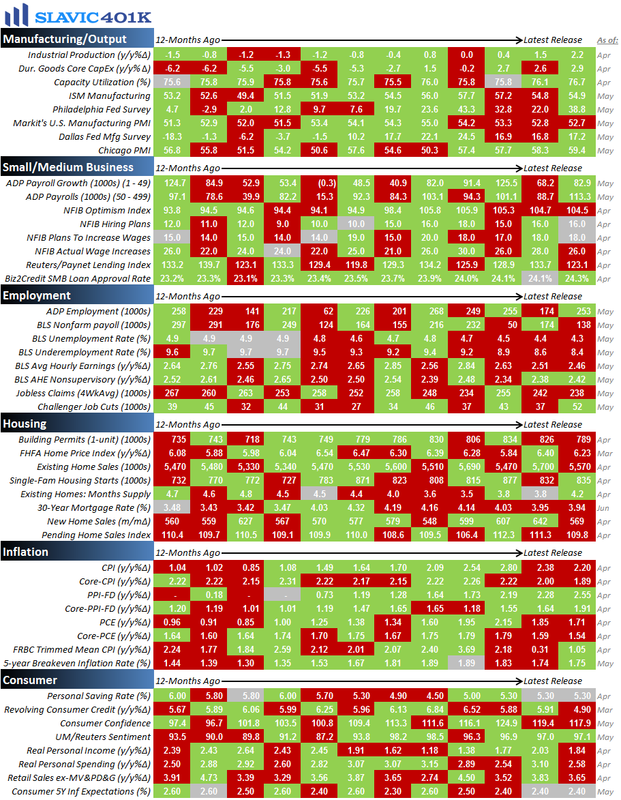 As for the negatives, the nation’s trade deficit widened, mortgage and refinance applications declined, pending home sales slid, construction spending unexpectedly contracted, motor vehicle sales disappointed forecasts, gauges of national manufacturing activity softened, consumer confidence cooled, corporate layoff announcements jumped, initial jobless claims increased, average hourly earnings continued to rise at a sluggish pace, and nonfarm payrolls growth decelerated considerably, a side effect of the economy nearing full employment. This week the pace of economic data slows down but there are still a few important reports on manufacturing, services sector activity, productivity, consumers, and employment scheduled to be released.